A while back, a friend told me about a Mass that she had attended where there had been reference to "Mary, Undoer of Knots" in the homily. We both quite aware of many of the titles that our Blessed Mother claims....Our Lady of Guadalupe/Kibeho/Fatima/Lourdes, Mary Queen of the Universe, Mother of Perputal Help, Mary Mother of God, and many, many more. 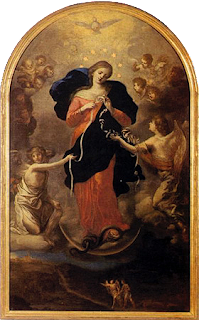 But Mary, Untier (or Undoer) of Knots was a new one for both of us. About a month or so ago, I got an email from a friend, who asked for prayers for her stomach issues. Knots. My mind went back to this particular Marian title, and I did a quick google search for it, so I could send her more info. I came across this wonderful website. And there was this image of Our Lady, undoing the knots in our lives which hold us bound. As I read the description, I was pretty sure that this novena fit my life every bit as much as it did hers - maybe more. Not one for novenas, and not a totally committed Rosary pray-er, I felt drawn to this one. And besides, October is the month of the Rosary, I reasoned. Each evening for 9 days, I made time to say and mediate on the mysteries of the Rosary and added in the designated Novena prayers at the end of the 3rd and 5th mysteries. I don't know if you are supposed to have a different knot for our Blessed Mother each night, but mine was pretty much the same one every night. I couldn't tell much difference from day to day. On the ninth day, the prayer was one of Thanksgiving, thanking the Blessed Mother for untying whatever knot, and I couldn't help but think, "but I don't think anything has happened yet....I'm not even finished with this rosary." Oh, me of little faith. It HAS been better. Can't explain it. Can't say how long it might last. But, as has often happened, grace entered my life when I least expected it, and at least for a little while...that knot is no longer holding me bound.